ELECTRIC JET (our smallest) – 1.5 gpm at 1400 psi to lengths of 35 feet. 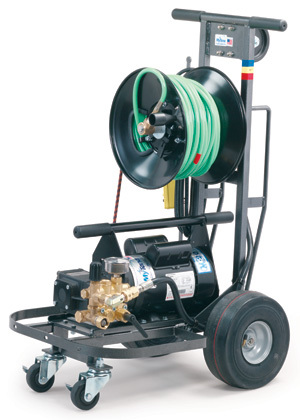 Used for smaller drain lines from 1″ up to 3″. 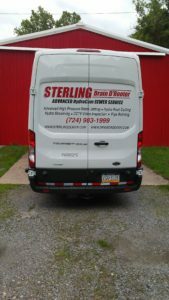 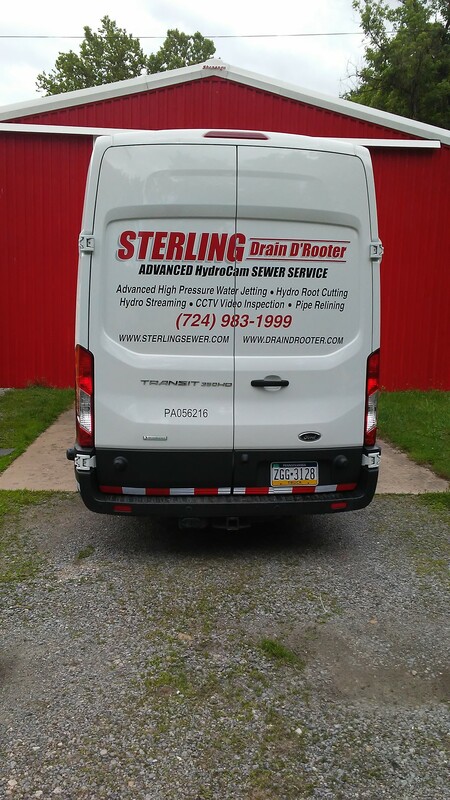 Specifically for kitchen or restroom sinks, urinals, vent lines and floor drains. 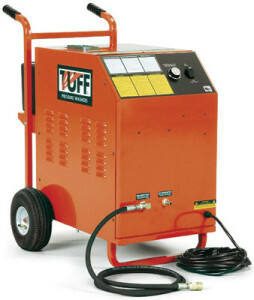 ELECTRIC JET – 2.5 gpm at 1200 psi to lengths of 100 feet. Used for smaller drain lines from 2″ up to 4″. 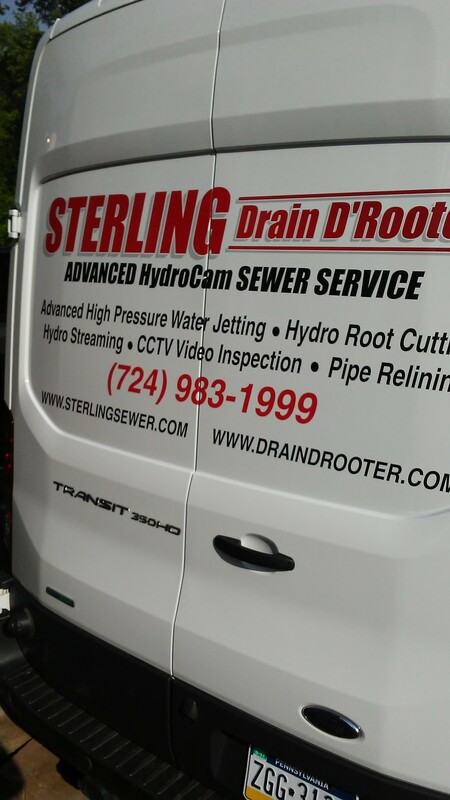 Specifically for interior branch lines, floor drains, basement toilets and sinks. 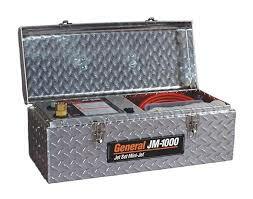 GAS JETTER – 8.5 gpm at 4000 psi for 1 1/2″ to 12″ pipe to lengths of 400 feet. 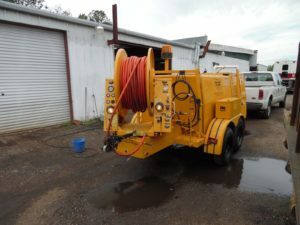 Used for laterals and mains to clear just about any type of clog. 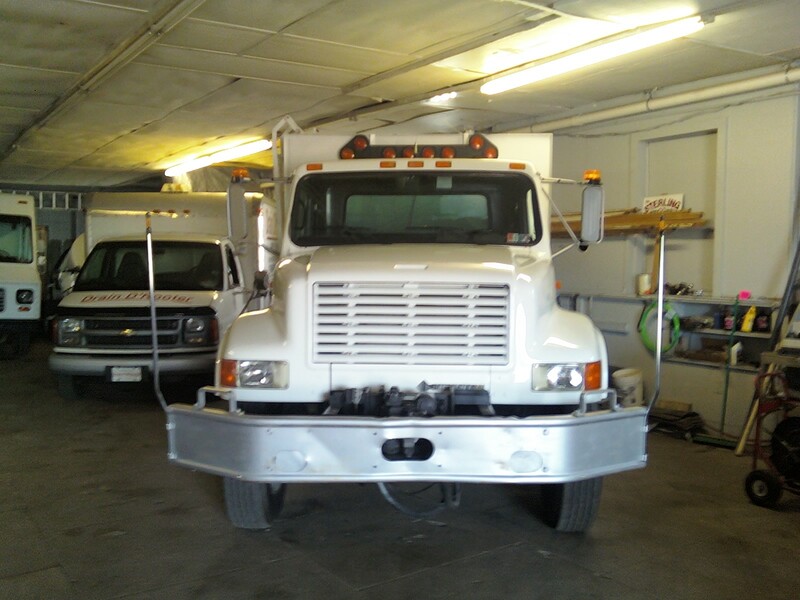 This unit was engineered in house and custom built to our specifications. It is a root annihilating, grease removing, scale busting awesome machine. 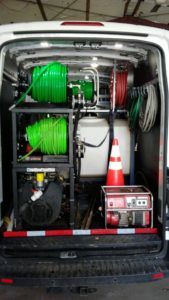 TRAILER JET – 40 gpm at 2000 psi with rotating rear mounted hose reel and 750 gallon water tank. 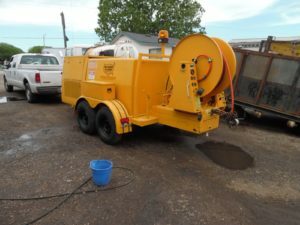 Used for 6″ to 24″ pipe to lengths of 500 feet. 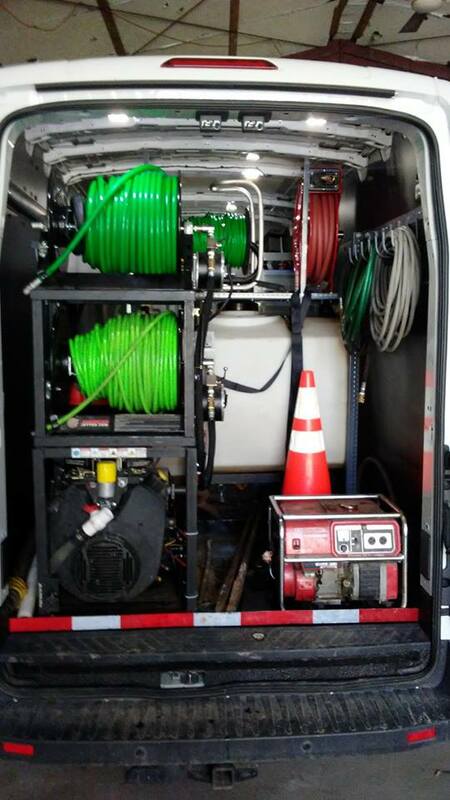 TRUCK JETTERS – (left) 65 gpm at 2000 psi with rotating front mounted 600 foot hose reel and 1600 gallon water tank. 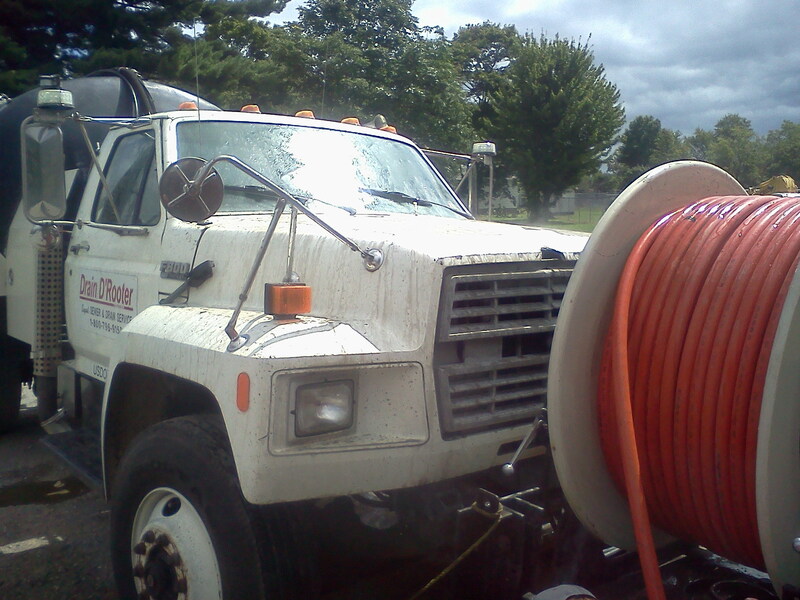 (right) 60 gpm at 1800 psi with rear mounted 800 foot hose reel and 1000 gallon water tank. 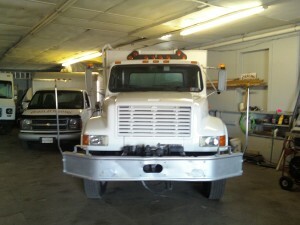 Both units are used for 6″ to 24″ pipe. Used to remove just about anything that can clog a main line sewer.